پایش آتشفشان‌های نیمه فعال مانند آتشفشان دماوند ضروری است. هدف از این پژوهش، ارزیابی تغییرات دمای سطح زمین (LST) بر اساس تصاویر ماهواره لندست در یک بازه زمانی 23 ساله در ناحیه آتشفشان دماوند بوده است. مناطق با ناهنجاری حرارتی و مرتبط با فعالیت زمین‌گرمایی بر اساس تصاویر روز و شب سنجنده لندست استخراج شده‌اند. مقدار شار حرارتی زمین‌گرمایی (GHF) در مناطق زمین‌گرمایی به طور میانگین W/m2 42 (در تصویر روز) وW/m2 20 (در تصویر شب) برآورد می‌شود. مقدار کل GHF تابشی در تمامی مناطق ناهنجاری حرارتی معادل با 50 مگاوات در تصویر شب و 119 مگاوات در تصویر روز برآورد می‌شود. نتایج پردازش‌ها در ناحیه دماوند نشان می‌دهد که ناهنجاری‌های حرارتی ارتباط فضایی نزدیکی با گسل‌ها، چشمه‌های آبگرم، لیتولوژی، دگرسانی گرمابی، مناطق با دگرشکلی فعال و مناطق با ناهنجاری شار حرارتی به‌دست‌آمده از داده‌های زیرسطحی دارند. از شش تصویر لندست که که در فاصله سال‌های 1988 تا 2011 و در ماه و ساعت یکسانی برداشت شده بودند برای مقایسه تغییرات دمایی استفاده شد. در تصاویر سالهای 2002 و 2007، دماوند فعال‌تر بوده و افزایش LST در مناطق با ناهنجاری حرارتی دیده می‌شود که در سال 2007 تغییراتی در شیمی چشمه‌ها و فعالیت‌های لرزه ای نیز مشاهده شده است. با توسعه و رفع خطاها، می‌توان از دورسنجی مادون قرمز حرارتی به عنوان روشی کم‌هزینه همراه با سایر روش‌های تکمیلی، در پایش تغییرات آتشفشان دماوند و سایر آتشفشان‌های کشور بهره گرفت. Monitoring quiescent volcano such as Damavan is vital. In this research, we investigate the changes of land surface temperature (LST) around the Damavand volcano during 23 years period. The evaluations were done on the thermal anomaly areas related to geothermal activity and results compared with non-anomalously thermal areas. The surface thermal anomalies were detected on the basis of processing of Landsat day and night-time images and combination with geological information layers. The average of calculated values for geothermal heat flux (GHF) in the geothermal areas was 42 W/m2 (in the day-time image) and 20 W/m2 (in night-time image). The total radiant GHF in thermal anomaly areas estimated 50 MW (in night-time image) and 119 MW (in the day-time image). The thermal anomaly areas have a close spatial relationship with faults, hot springs, lithology, hydrothermal alterations, active deformation regions and subsurface high heat flow data. After determining thermal anomaly areas related to the geothermal activity, the changes of LST patterns were compared in the six TM and ETM+ images (captured from the same month and overpass time) during 1988- 2011. The highest temperatures were recorded in 2002 and 2007 images, that in line with seismic events and changes in hot springs chemistry. The thermal infrared remote sensing can be used as a cost effective and concise method for monitoring of quiescent and even dormant volcanoes of Iran. اسکندری، ا.، 1395- بررسی تحولات ماگمایی گدازه‌های دماوند با تکیه بر ویژگی‎های کانی‌شناسی و ژئوشیمیایی، رساله دکترای دانشگاه خوارزمی. معین‎وزیری، ح.، 1377- دیباچه ای بر ماگماتیسم در ایران، انتشارات دانشگاه خوارزمی، 440 ص.
Allen, M. B., Ghassemi, M. R., Shahrabi, M. and Qorashi M., 2003- Accomodation of the late Cenozoic oblique shortening in the Alborz range, northern Iran. J Struct Geol 25:659–672. doi: 10.1016/S0191-8141(02)00064-0. Allenbach, P., 1966- Geologie und Petrographie des Damavand und seiner Umgebung (Zentral-Elbruz) Iran. Dissertation. Mitt Geol Inst ETH, Univ. Zurich. Bachmann, O., Miller, C. F. and De Silva, S. L., 2007- The volcanic–plutonic connection as a stage for understanding crustal magmatism. Journal of Volcanology and Geothermal Research, 167(1), pp.1-23. Barsi, J. A., Barker, J. L. and Schott, J. R., 2003- An Atmospheric Correction Parameter Calculator for a Single Thermal Band Earth-Sensing Instrument, Proc. IEEE IGARSS, 21–25 July 2003, Toulouse, France, 3014–3016. Bartlett, M. G., Chapman, D. S., Harris, R. N., 2006- A Decade of Ground–Air Temperature Tracking at Emigrant Pass Observatory, Utah. J Climate 19: 3722–3731. doi: http://dx.doi.org/10.1175/JCLI3808.1. Berberian, M., 1976- An explanatory note on the first seismotectonic map of Iran; A seismo-tectonic review of the country. Geol. Surv. Iran. 39, 7-141. Cecchi, E., Van Wyk de Vries, B. and Lavest, J. M., 2005- Flank spreading and collapse of weak-cored volcanoes. B Volcanol 67: 72–91, doi: 10.1007/s00445-004-0369-3. Chander, G. and Markham, B. L., 2003- Revised Landsat-5 TM radiometric calibration procedures, and post-calibration dynamic ranges. IEEE Trans Geosci Remote Sens 41: 2674−2677. doi: 10.1109/TGRS.2003.818464. Chander, G., Markham, B. L., Helder, D. L., 2009- Summary of current radiometric calibration coefficients for Landsat MSS, TM, ETM+, and EO-1 ALI sensors. Remote Sens Environ 113(5): 893-903. doi: 10.1016/j.rse.2009.01.007. Clynne, M. A. and Muffler, L. J. P., 2010- Geologic map of Lassen Volcanic National Park and vicinity, California. US Department of the Interior, US Geological Survey. Clynne, M. A., Calvert, A. T., Wolfe, E. W., Evarts, R. C., Fleck, R. J. and Lanphere, M. A., 2008- The Pleistocene eruptive history of Mount St. Helens, Washington, from 300,000 to 12,800 years before present. US Geological Survey professional paper, (1750), pp.593-627. Coolbaugh, M. F., Kratt, C., Fallacaro, A., Calvin, W. M. and Taranik, J. V., 2007- Detection of geothermal anomalies using Advanced Spaceborne Thermal Emission and Reflection Radiometer (ASTER) thermal infrared images at Brady’s Hot Springs, Nevada, USA, Remote Sens Environ 106: 350-359. doi: 10.1016/j.rse.2006.09.001. Cooper, K. M. and Kent, A. J., 2014- Rapid remobilization of magmatic crystals kept in cold storage. Nature, 506(7489), pp.480-483. Davidson, J., Hassanzadeh, J., Berzins, R., Stockli, D. F., Bashukooh, B., Turrin, B. and Pandamouz, A., 2004- The geology of Damavand volcano, Alborz Mountains, northern Iran. Geol Soc Am Bull 116(1-2): 16-29. doi: 10.1130/B25344.1. ENEL, 1978- Geothermal Power Development Studies, Damavand Zone, General Report. Eskandari, A., De Rosa, R. and Amini, S., 2015- Remote sensing of Damavand volcano (Iran) using Landsat imagery: Implications for the volcano dynamics. Journal of Volcanology and Geothermal Research, 306, pp.41-57. Flynn, L. P, Harris, A. J. L. and Wright, R., 2001- Improved identification of volcanic features using Landsat 7 ETM+. Remote Sens Environ 73: 180–193. doi: 10.1016/S0034-4257(01)00258-9. Fu, P. and Rich, P. M., 2000- The Solar Analyst 1.0 Manual. Helios Environmental Modeling Institute (HEMI), USA. Fu, P. and Rich, P. M., 2002- A Geometric Solar Radiation Model with Applications in Agriculture and Forestry. Comput Electron Agric. 37:25–35. doi: 10.1016/S0168-1699(02)00115-1. Ghazban, F., 2000- Geological and geochemical investigation of Damavand geothermal Prospect, Central Alborz Mountain, Northern Iran. GRC Transactions 24: 229-234. Haselwimmer, C. and Prakash, A., 2013- Thermal Infrared Remote Sensing of Geothermal Systems. In: Kuenzer C, Dech S (eds) Thermal Infrared Remote Sensing. Springer, Netherlands, (pp. 453-473). Ji, L., Xu, J., Lin, X., and Luan P., 2010- Application of satellite thermal infrared remote sensing in monitoring magmatic activity of Changbaishan Tianchi volcano. Chin Sci Bull 55(24), 2731-2737. doi: 10.1007/s11434-010-3232-2. Jimenez-Munoz, J. C. and Sobrino, J. A., 2003- A generalized single-channel method for retrieving land surface temperature from remote sensing data, J Geophys Res 108 (D22), 4688, doi: 10.1029/2003JD003480. Mia, M. B., Bromley, C. J. and Fujimitsu, Y., 2012- Monitoring heat flux using Landsat TM/ETM+ thermal infrared data—A case study at Karapiti (‘Craters of the Moon’) thermal area, New Zealand. J Volcanol Geotherm Res 235: 1-10. doi: http://dx.doi.org/10.1016/j.jvolgeores.2012.05.005. Mortazavi, M. and Sparks, R. S. J., 2011- Using Wind Data to Predict the Risk of Volcanic Eruption: An Example from Damavand Volcano, Iran. Iranian Journal of Earth Sciences 3: 127-133. Mostafanejad, A., Hossein Shomali, Z. and Mottaghi, A. A., 2011- 3-D velocity structure of Damavand volcano, Iran, from local earthquake tomography. J Asian Earth Sci 42(6): 1091–1096. doi:10.1016/j.jseaes.2011.03.011. Qin, Q., Zhang, N., Nan, P. and Chai, L., 2011- Geothermal area detection using Landsat ETM+ thermal infrared data and its mechanistic analysis—A case study in Tengchong, China. Int J Appl Earth Obs Geoinf. 13(4): 552-559. doi: 10.1016/j.jag.2011.02.005. Ramsey, M. S. and Flynn, L. P., 2004- Strategies, insights, and the recent advances in volcanic monitoring and mapping with data from NASA's Earth Observing System. J Volcanol Geotherm Res 135:1–11. doi:10.1016/j.jvolgeores.2003.12.015. Ramsey, M. S. and Harris, A. J., 2013- Volcanology 2020: How will thermal remote sensing of volcanic surface activity evolve over the next decade?. J Volcanol Geotherm Res 249: 217-233. doi: 10.1016/j.jvolgeores.2012.05.011. Ritz, J. F., Nazari, H., Ghassemi, A., Salamati, R., Shafei, A., Solaymani, S. and Vernant, P., 2006- Active transtension inside Central Alborz: a new insight into northern Iran–southern Caspian geodynamics. Geology 34 (6), 477–480. doi: 10.1130/G22319.1. Savage, S. L., Lawrence, R. L., Custer, S. G., Jewett, J. T., Powell, S. L. and Shaw, J. A., 2010- Review of Alternative Methods for Estimating Terrestrial Emittance and Geothermal Heat Flux for Yellowstone National Park Using Landsat Imagery. GISci Remote Sens 47 (4): 460– 479. doi: 10.2747/1548-1603.47.4.460. Shirzaei, M., Walter, T. R., Nankali, H. R. and Holohan, E. P., 2011- Gravity-driven deformation of Damavand volcano, Iran, detected through InSAR time series. Geology 39 (3): 251–254. doi: 10.1130/G31779.1. Shomali, Z. H. and Shirzad, T., 2014- Crustal structure of Damavand volcano, Iran, from ambient noise and earthquake tomography. J Seismol: 1-10. doi: 10.1007/s10950-014-9458-8. Siebert, L., Simkin, T. and Kimberly, P., 2011- Volcanoes of the World. Univ of California Press. Sobrino, J. A. and Raissouni, N., 2000- Toward Remote Sensing methods for land cover dynamic monitoring. Application to Morocco, Int J Remote Sens 21: 353–366. doi: 10.1080/014311600210876. Sobrino, J. A., Jiménez-Muñoz, J. C. and Paolini, L., 2004- Land surface temperature retrieval from LANDSAT TM 5. Remote Sens environment 90(4): 434-440. doi:10.1016/j.rse.2004.02.003. Sobrino, J. A., Jiménez-Muñoz, J. C., Sòria, G., Romaguera, M., Guanter, L., Moreno, J., Plaza, A. and Martínez, P., 2008- Land surface emissivity retrieval from different VNIR and TIR sensors. IEEE Transactions on Geoscience and Remote Sensing 46(2): 316-327. doi: 10.1109/TGRS.2007.904834. Sparks, R. S. J., 2003- Forecasting volcanic eruptions. Earth Planet Sci Lett 210(1): 1-15. doi: 10.1016/S0012-821X(03)00124-9. Sparks, R. S. J., Biggs, J. and Neuberg, J. W., 2012- Monitoring volcanoes. Science, 335(6074), pp.1310-1311. Stock, M. J., Humphreys, M. C., Smith, V. C., Isaia, R. and Pyle, D. M., 2016- Late-stage volatile saturation as a potential trigger for explosive volcanic eruptions. Nature Geoscience, 9(3), pp.249-254. Vajedian, S., Motagh, M. and Nilfouroushan, F., 2015- StaMPS improvement for deformation analysis in mountainous regions: Implications for the Damavand volcano and Mosha fault in Alborz. Remote Sensing, 7(7), pp.8323-8347. Vaughan, R. G., Keszthelyi, L. P., Lowenstern, J. B., Jaworowski, C. and Heasler, H., 2012- Use of ASTER and MODIS thermal infrared data to quantify heat flow and hydrothermal change at Yellowstone National Park. Journal of Volcanology and Geothermal Research, 233: 72-89. doi: 10.1016/j.jvolgeores.2012.04.022. 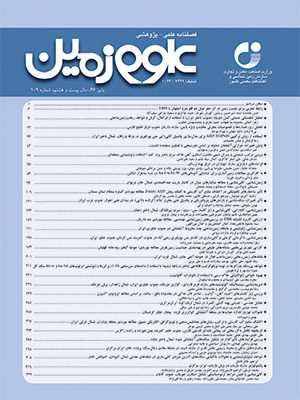 Vernant, P., Nilforoushan, F., Chéry, J., Bayera, R., Djamour, Y., Masson, F., Nankali, H., Ritz, J. F., Sedighi, M. and Tavakoli, F., 2004- Deciphering oblique shortening of Central Alborz in Iran using geodetic data. Earth Planet Sci Lett 223: 177–185. doi: 10.1016/j.epsl.2004.04.017. Watson, F. G. R., Lockwood, R. E., Newman, W. B., Anderson, T. N. and Garrott R. A., 2008- Development and comparison of Landsat radiometric and snowpack model inversion techniques for estimating geothermal heat flux. Remote Sens Environ: 112(2):471–481. doi: 10.1016/j.rse.2007.05.010. Yazdanparast, M. and Vosooghi, B., 2013- A research on Damavand magma source model using GPS data. Geomat, Nat Haz Risk 5 (1): 26-40. doi: 10.1080/19475705.2013.772543. Zare, M. and Aryamanesh, M., 2008- Damavand Volcanic System in Central Alborz mountains of Iran; A study on the possibility of a new erruption. International Geological Congress, Oslo.